“Crying Wolf” once got a mischievous young shepherd into a world of trouble! Initially, towns folk had come a runnin, only to discover the warned of wolf was a hoax and the young lad laughing it up BIG time at their apparent gullibility. Just as certain as you know the rest of this sad tale, rest assured that crying “Wolf” doesn’t always lead us on the path of ruin…at least not when it comes to DXing that is! Already for members of the Dx Adventure Radio Club, I have reviewed the RadioWavz Bazooka and the Buddipole and it was clear that both of these antennas are hot options for those 27 MHz DXers living in quarters which do not allow large vertical or horizontal arrays, as well as those hobbyists who are looking for viable alternatives on outdoor DX adventures. A short while back, well, I stumbled across in my net travels another interesting dipole product named the ‘Wolf’ or ‘Wolf Bay’ which I decided to order across from 2 Division and add to my current 12m One Man Tower setup. For those unaccustomed to my latest discovery, the Wolf Bay 11m is a half wave centre mounted dipole for the 11m band with one heck of a rep. It is centre fed with a gamma match and is tuneable from 25 to 30 MHz (but also available for other bands). 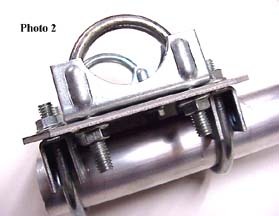 Like most other dipoles suitable for 27 MHz such as the Buddy, Bazooka or G5RV, it can be mounted for vertical or horizontal polarization on a tower or pole or any other suitable structure which makes it versatile and suitable for DXpedition activity. What also appealed about the Wolf Bay was its all aluminium DC grounded design which makes it super for the high lightning and static area encountered at my QTH – particularly in the summer storm season. Apparently, this antenna does not attract lightning like the common fiberglass antenna and can withstand a substantial discharge with minimal or no damage. 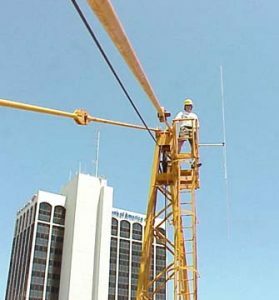 In my opinion, another one of the advantages of this dipole is that it is easier to mount than a bride on her wedding night. I was also surprised with its performance in comparison to a couple of older verticals (ie. station master mk1 and a ringo) that I had lying around in the back yard. 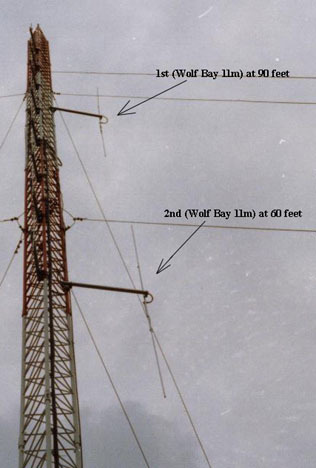 When replacing a radial-less Antron 99 with a Wolf Bay dipole on my tower, a minimum of 3 to 5 dB gain was realized in almost every direction. I had to check the readings twice but it was accurate and the A-99 was not floored. The length is close to 18 ft. over all and the mounting boom is 3 ft. long 1-1/2 inch diameter thick wall pipe. Stock power handling is 1kw and high power version is 5 kW although these features are obviously useless on the Citizens Band or Freeband where the use of such power would bring unwanted attention from the local radio police. 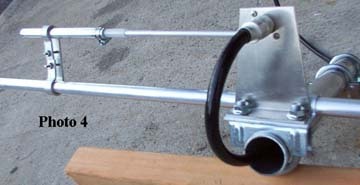 This antenna is considered to be omnidirectional but its pattern is offset a little in the direction away from the support structure. The theoretical gain of a half wave dipole is only 2.1 dB but the improvement seen by switching from a fiberglass antenna to this type is dramatic. Furthermore, two or more Wolf Bay 11m’s can be phased together to give higher gain and pattern shaping but unfortunately I didn’t do my homework properly and order two of them. Apparently, if two Wolves are mounted side by side 9 feet apart or more and fed in phase a bi-directional figure eight pattern results. Two Wolves stacked one over the other and spaced at least 3/4 wave produces a high gain omni. This is the configuration I would love to use down the track cos it would make one helluva improvement on the existing setup.